It's summertime and our thoughts naturally turn to pulled pork. Well, mine do anyway! Unfortunately, my current outdoor gas grill is not up to the task; so I made my indoor version. My indoor oven-barbecued pulled pork is a variation on my braised pork shoulder (I'll post that during fall or winter). As always, I used carefully sourced pork, not from CAFOs. I don't know about you, but I don't like to dirty up every pot and pan in the house unless I have to. So I devised this recipe to be a no-muss-no-fuss-all-in-one-pan kinda thang. It makes enough for six big sandwiches or a dozen sliders. If you're making big sandwiches, whip up a batch of my homemade hamburger buns. 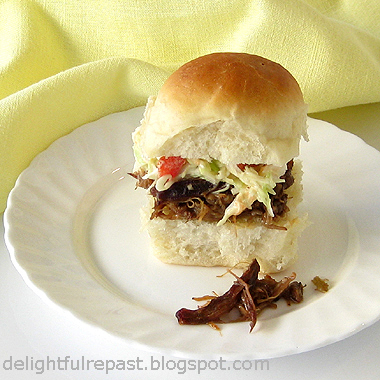 If you're making little sliders (as pictured), try my homemade slider buns. Pulled pork can be made a day ahead. Just reheat, tightly covered, at 300 degrees for an hour before serving. I like mine without any extra barbecue sauce and with coleslaw on top of the meat. My husband likes his with extra barbecue sauce and the coleslaw on the side (in a separate dish, of course--he's like Monk, doesn't want his foods touching!). 1 Preheat oven to 450 degrees. Oil 12-inch straight-sided skillet (Mine is the All-Clad Stainless 6-Quart Saute Pan) with the organic canola oil. In small bowl, combine ingredients for dry rub; set aside. In another small bowl, stir together ingredients for west rub; set aside. 2 Cover pork strips with wet rub on all sides, then with dry rub. Arrange strips in single layer in oiled 12-inch straight-sided skillet. Roast 35 minutes; turn strips and continue roasting for 15 minutes, until well browned. Keep an eye (and nose!) on it. You want browned bits as the foundation of your braising liquid, but burned bits will ruin it! 3 Transfer strips to plate; set aside. Reduce oven temperature to 300 degrees. Pour off all but about a tablespoon of fat from the skillet. Add the onion, celery, and carrot to the pan and cook until soft, about 12 minutes. Over medium heat, add water and soy sauce and bring to simmer, scraping up browned bits. 4 Bring to boil and add strips; return to boil, cover pan tightly with foil and lid and simmer in 300 oven for 2 hours. The pork is not completely submerged in liquid, so the crispy edges formed by the initial roasting will stay that way. 5 Transfer strips to 1.5-quart oval Corning casserole or something similar. Strain braising liquid into 2-cup glass measure, pressing out liquid from solids; discard solids. With small ladle, remove fat from top of liquid. Add water, if needed, to bring volume of sauce to 1/2 cup. Stir in barbecue sauce. 6 With two forks, shred pork in casserole, removing any large pieces of fat. Stir in sauce. Serve immediately or cover tightly and refrigerate until ready to reheat and serve. Good morning Jean. I must admit I have never heard of ,"pulled pork," before. I have now completed a Google search and discovered what it is. Thanks for the wonderful recipe above. The reason French food is so amazing. I think, is because of all the sauces and marinades they create. You seem to have caught that creativity. Tony, if you were called Southerner in the US, you would grow up knowing about pulled pork. Southern England, not so much! My paternal grandmother was my Southern (US) influence; mother's side, the English influence. LOVE the new header! It brings a fun new look to your site. be a sign that i need to make them!! Hope you had a great week... enjoy the long holiday weekend! Hope you like the pulled pork as much as we do. Okay, Sully, I'll write more about marinades and rubs someday. In the meantime, just try to leave whatever you're cooking in the oven ALONE for the prescribed time, no poking and prodding. Pulling is a whole other matter! I have never made a pulled pork...yours sandwich looks lipsmacking! Thanks, Angie! I hope you'll try it soon. Trying to find out what a slider is, when I stumbled across your blog. A slider seems to require about 35g (before baking) of a soft dough, but I couldn't find guidance on normal size. Only recently learned about pulled pork and your recipe seems very good. Definitely going to try both, but for the sliders I'll add 1 egg and 1/4 cup of sunflower oil to a standard bread dough made with 500g of all purpose flour. Should work. So glad you found me! Yes, the 500 grams of flour (same as my recipe) will make 24 just-the-right-size slider buns. Let me know how it turns out for you! that is just about the prettiest sandwich i have ever seen. no wonder you take only food pics. these are great. Sandra, thank you so much! I'm having fun with it. I recently bought some pork all pre-seasoned (yes, I'm always looking for easy meals) and served up pulled pork sandwiches. I never make these, so the family was pretty excited about them. Until the first bite. The seasoning was so strong. Ugh. We had cereal that night. I'm printing out your recipe now. I knnooow! All the women's magazines are always touting these products, but I've never tried them. I assumed - apparently, correctly - they would be over-seasoned, at least too salty. Let me know how this recipe turns out for you, Ruth. I love pulled pork! I always thought it would take to much preparation to make it but this don't look too bad. Especially if the leftovers are easy to freeze. I'd serve mine with with some chunky apple sauce inside and with a glass of Pinot Noir. Thanks, Richard! And I'll try a glass of pinot noir with it next time. It's the one wine I always have on hand, my favorite.